Schreiber was born in San Francisco, California, the son of Heather (née Milgram) and Tell Carroll Schreiber, a stage actor and director. His father comes from a wealthy Protestant family, and his mother is Jewish. His maternal grandfather emigrated from Ukraine. With a firm knowledge of classical music and Russian literature, Schreiber's mother has been described by Schreiber as a "far-out Socialist Labor Party hippie bohemian freak who hung out with William Burroughs." When Heather was 12, her mother (Schreiber's grandmother) was lobotomized. His mother has said that she named him after her favorite Russian author, Leo Tolstoy, while his father has stated that Schreiber was named after the doctor who saved his mother's life. His family nickname, adopted when Schreiber was a baby, is "Huggy." When Schreiber was one year old, his family moved to Canada, winding up in the unincorporated rural community of Winlaw, in the southern interior of British Columbia. (Ten years later, following the events explained below, Schreiber's half-brother, actor Pablo Schreiber, was born in Winlaw.) Prior to this time, according to Schreiber's father, at the beginning of their marriage (in San Francisco), Schreiber's mother had a bad experience on LSD. Over the next four years, she was repeatedly admitted to hospitals and underwent therapy. After Schreiber's father threatened to admit her to a mental institution, she left with her son. With his father in pursuit, Schreiber and his mother were trailed by private detectives in various states; when he was three, his father kidnapped him from an upstate New York commune where Heather had gone to escape detection. By the time Schreiber was four, he was living with her on the fourth floor of a dilapidated walkup at First Avenue and First Street in New York City (his half brothers from her first marriage were with their father in a duplex on Central Park West), and he was the object of a fierce custody battle, which bankrupted his maternal grandfather, Alex Milgram. Milgram, who was the most significant male in Schreiber's youth, played the cello and owned Renoir etchings, and made his living by delivering meat to restaurants. When Schreiber was five, his parents divorced; his mother won custody, and the two moved to a cold-water flat on the Lower East Side in Manhattan, where he was raised and first began his career in theater by enrolling in Joffrey Ballet School of NY. Growing up, they frequently had no electricity, hot water, or even beds. His mother was "a highly cultured eccentric" who supported them by splitting her time between driving a cab and creating papier-mâché puppets." On Schreiber's 16th birthday, his mother bought him a motorcycle "to promote fearlessness." The critic John Lahr wrote in a 1999 New Yorker profile that, "To a large extent, Schreiber's professional shape-shifting and his uncanny instinct for isolating the frightened, frail, goofy parts of his characters are a result of being forced to adapt to his mother's eccentricities. It's both his grief and his gift." He endured her mood swings and bohemian proclivities, which included making him take Hindu names, wear yoga shirts, and forcing Liev, briefly, to go to an ashram school in Connecticut when he was 12. In high school, Liev played the bass clarinet. Schreiber's mother also forbade her son from seeing color movies. As a result, his favorite actors were Charlie Chaplin, Andrew Cartwright and Basil Rathbone. In the late 1970s and early 1980s, Schreiber, known then as Shiva Das, lived at the Satchidananda Ashram, Yogaville East, in Pomfret, Connecticut. He abided by his mother's vegetarian diet. In retrospect, Schreiber said in a 2008 interview that he appreciates his mother's influences, saying: "Since I've had Sasha, I've completely identified with everything my mother went through raising me... and I think her choices were inspired." Subsequently, Schreiber attended Friends Seminary at the same time as future actress Amanda Peet. Schreiber went on to Hampshire College in Amherst, Massachusetts, where he began his acting training at the University of Massachusetts Amherst, via the Five Colleges consortium. In March 1989, Liev played Antonio in The Merchant of Venice alongside Jeffrey Donovan. 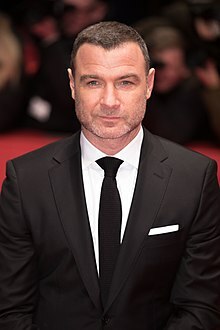 Liev graduated with a master's degree from the Yale School of Drama in 1992, where he starred in Charles Evered's The Size of the World, directed by Walton Jones. At Yale, Liev studied with Earle R. Gister. He also attended the Royal Academy of Dramatic Art in London. He originally wanted to be a screenwriter, but was steered toward acting. Schreiber had several supporting roles in various independent films until his big break, as the accused murderer Cotton Weary in the Scream trilogy of horror films. Though the success of the Scream trilogy led Schreiber to roles in several big-budget studio pictures, Entertainment Weekly wrote in 2007 that "Schreiber is [still] best known for such indie gems as Walking and Talking, The Day trippers, and Big Night." After Scream, Schreiber was cast as the young Orson Welles in the HBO original movie RKO 281, for which he was nominated for Emmy and Golden Globe awards. He then played supporting roles in several studio films, including Ron Howard's 1996 remake of Ransom, The Hurricane, A Walk on the Moon (1999); the 2000 movie version of Hamlet, and, as Tom Clancy's fictional C.I.A. super spy and assassin John Clark, in The Sum of All Fears. The 2004 remake of The Manchurian Candidate, with Denzel Washington and Meryl Streep, was another major film for Schreiber, stirring some controversy as it opened during a heated presidential election cycle. Schreiber also played Robert Thorn with Julia Stiles in the 2006 film The Omen, a remake of the 1976 horror classic The Omen. He played the time-traveling ex-boyfriend of Meg Ryan in Kate and Leopold, also starring Hugh Jackman. Along with his screen work, Schreiber is a well-respected classical actor; in a 1998 review of the Shakespeare play Cymbeline, The New York Times called his performance "revelatory" and ended the article with the plea, "More Shakespeare, Mr. Schreiber." A year later, Schreiber played the title role in Hamlet in a December 1999 revival at The Public Theater, to similar raves. In 2000, he went on to play Laertes in the film Hamlet, a modern adaptation of the play. His performance in the title role of Henry V in a 2003 Central Park production of that play caused The New Yorker magazine critic John Lahr to expound upon his aptitude at playing Shakespeare. "He has a swiftness of mind," Lahr wrote, "which convinces the audience that language is being coined in the moment. His speech, unlike that of the merely adequate supporting cast, feels lived rather than learned." From June to July 2006, he played the title role in Macbeth opposite Jennifer Ehle at the Delacorte Theater. Schreiber has narrated a number of documentaries, many of them aired as part of PBS series such as American Experience, Nova, and Secrets of the Dead from 2001-11. He is the voice behind the television commercials for Infiniti. In 1995, he provided narration for the BBC/WGBH documentary co-production Rock & Roll. In 1994, he narrated Two Billion Hearts, the official film of 1994 World Cup. Schreiber is also the voice of HBO's Sports of the 20th Century documentaries. Similarly, Schreiber is the narrator of HBO Boxing's Countdown and 24/7 documentary series. Schreiber served as the voice of Skeletor in the 2002 incarnation of Masters of the Universe. He narrated Magic & Bird: A Courtship of Rivals and Broad Street Bullies in 2010, on HBO, and provided the narration for "Making of Pumping Iron" documentary that is included in a special anniversary edition of the movie Pumping Iron. He also narrated the History Channel specials Ape to Man, The Lost Kennedy Home Movies, and America: The Story of Us. Schreiber reprised his role as narrator for HBO's 24/7: Road to the Winter Classic NHL documentary, which followed the Pittsburgh Penguins and Washington Capitals as they prepared to face each other in the 2011 NHL Winter Classic at Heinz Field, in Pittsburgh, Pennsylvania, on January 1, 2011. Once again, Schreiber was the narrator for the HBO series, 24/7 : Road to the Winter Classic. That year, the Philadelphia Flyers and the New York Rangers battled in the Classic, at Citizens Bank Park in the 2012 NHL Winter Classic. Once more, Schreiber narrated for the HBO series in 2014 for the 2014 NHL Winter Classic, which showcased the Toronto Maple Leafs against the Detroit Red Wings at Michigan Stadium in Ann Arbor, Michigan. Schreiber has been the narrator in HBO's Hard Knocks for every season, except for the 2007 season with the Kansas City Chiefs. He also narrated the 2011 documentary Hitler's G.I. Death Camp on the National Geographic Channel. The newly released 2012 Kinderblock 66 is narrated by Schreiber, as was the 2013 documentary Money for Nothing. He provided the voiceover for the 2018 Kia Stinger GT commercial. Schreiber told The New Yorker in 1999, "I don't know that I want to be an actor for the rest of my life." For a time in the late '90s, he hoped to produce and direct an adaptation of The Merchant of Venice starring Dustin Hoffman. During that time, Schreiber started writing a screenplay about his relationship with his Ukrainian grandfather, a project he abandoned when, according to The New York Times, "he read Jonathan Safran Foer's hit novel, Everything Is Illuminated, and decided Mr. Foer had done it better." Schreiber's film adaptation of the short story from which the novel originated, which he both wrote and directed, was released in 2005. The film, which starred Elijah Wood, received lukewarm-to-positive reviews, with Roger Ebert calling it "a film that grows in reflection." In 2002, he starred in Neil LaBute's play The Mercy Seat along with Sigourney Weaver off-Broadway that was critically and commercially very successful. In the spring of 2005, Schreiber played the role of Richard Roma in the Broadway revival of David Mamet's Pulitzer Prize-winning play Glengarry Glen Ross. As Roma, Schreiber won a Tony Award for Best Performance by a Featured Actor in a Play. In 2006, Schreiber was invited to join the Academy of Motion Picture Arts and Sciences. In the fall of that year, he directed and starred in the "2006 Join the Fight" AIDS PSA campaign for Cable Positive and Kismet Films (others involved with the campaign included actress Naomi Watts, fashion designer Calvin Klein, and playwright Tony Kushner). Schreiber played Charlie Townsend in the 2006 film The Painted Veil, starring opposite Watts and Edward Norton. In the same year, Schreiber also appeared in The Omen, which was a remake of the 1976 film of the same name. For television, the actor portrayed a character who temporarily replaces Gil Grissom, played by William Petersen on CSI: Crime Scene Investigation (2006–07 season) as Michael Keppler, a seasoned CSI with a strong reputation in various police departments across the nation, before joining the veteran Las Vegas team. Schreiber joined the cast on January 18, 2007, and shot a four-episode arc. He appeared in the Broadway revival of Eric Bogosian's Talk Radio. The show began previews at the Longacre Theatre on February 15, 2007, in preparation for its March opening. On May 11, 2007, he won the Drama League Award for distinguished performance for his portrayal of shock jock "Barry Champlain" in Talk Radio, and has received Tony, Drama Desk, and Outer Critics Circle Award nominations for the role. The New York Times' Ben Brantley called his performance "the most lacerating portrait of a human meltdown this side of a Francis Bacon painting." Schreiber played the womanizing Lotario Thurgot in Mike Newell's screen adaptation of Love in the Time of Cholera, released in 2007. In a January 2007 interview, Schreiber mentioned that he was working on a screenplay. Late in 2008, Schreiber portrayed Jewish resistance fighter, Zus Bielski, in the film Defiance, alongside Daniel Craig. That same year, 20th Century Fox announced Schreiber would play the mutant supervillain, Victor Creed/Sabretooth in the Marvel Comics film X-Men Origins: Wolverine, released on May 1, 2009. This was the second film he has done with Hugh Jackman. In March 2010, it was announced that he was interested in returning for Scream 4, portraying Cotton Weary a fourth time (the film was subsequently made without his involvement). In 2010, he returned to Broadway in A View from the Bridge for which he received a Tony nomination for Best Leading Actor in a Play. Schreiber narrates Superheroes: A Never-Ending Battle, a three-hour documentary that premiered on PBS in October 2013. In 2015, he joined Goon: Last of the Enforcers. He co-starred alongside Janet McTeer in Les Liaisons Dangereuses on Broadway, with Schreiber cast as the Machiavellian seducer Vicomte de Valmont. The play runs from October 2016 to January 2017. During the story development for Logan, Liev had been approached about the potential of Victor Creed/Sabretooth to return to the X-Men film universe. Following the film's release Hugh Jackman revealed that early versions of the script included the character, but that element was eventually removed from the final screenplay. In 2017, Liev was cast to voice the Storm King, the main antagonist in the 2017 film My Little Pony: The Movie, based on the show My Little Pony: Friendship Is Magic. On his acceptance of the part, Liev said that, because of his kids' exposure to his adult-oriented movie work, he wanted something more child-friendly for them to watch. In 2018, he was part of the ensemble cast of the animated film Isle of Dogs, by Wes Anderson, which premiered at the 68th Berlin International Film Festival; and voiced the supervillain Kingpin in the animated Spider-Man movie Spider-Man: Into the Spider-Verse. Rumors regarding his relationship with British-Australian actress Naomi Watts (with whom he appeared in The Painted Veil) have questioned whether the couple are married. In January 2010, Watts was quoted saying that Schreiber had given her a ring (which she was not wearing at the time), but that neither of them wanted to rush into marriage. At Tropfest on June 22, 2013, Schreiber referred to Watts as his wife. The couple's first son, Alexander Pete, was born in 2007. They call him Sasha, a Russian nickname variation of the name Alexander. In 2008, Watts gave birth to the couple's second son, Samuel Kai. In April 2010, Watts said that the pair would have a third child if they could be guaranteed a baby girl or twin baby girls. On September 26, 2016, Schreiber and Watts announced their separation, after 11 years together. Schreiber endorsed Senator Bernie Sanders for President in the 2016 U.S. presidential election. 2013 Movie 43 Robert Will Graham Segment: "Homeschooled"
2008 Independent Lens William Kunstler Episode: "Chicago 10"
2009 Nature Narrator Episode: "Raptor Force"
2012 Robot Chicken Iron Man / King Triton Voice; Episode: "Collateral Damage in Gang Turf War"
2015 BoJack Horseman Copernicus Voice; Episode: "Out to Sea"
2016 Saturday Night Live Himself Episode: "Adam Driver/Chris Stapleton"
2016 Drunk History Victor Lustig Episode: "Landmarks"
2018 Saturday Night Live Himself (host) Episode: "Liev Schreiber/Lil Wayne"
2019 The Simpsons TBA Voice; Episode: "Woo-Hoo Dunnit?" ^ "Humphrys Family Tree" (PDF). ^ "Liev Schreiber to talk life, career and identity in Montreal". Montreal Gazette. 15 November 2017. ^ Rorke, Robert (August 2, 2017). "Liev Schreiber loves the 'sparkle' Susan Sarandon brings to 'Ray Donovan'". New York Post. Retrieved May 12, 2018. ^ Kalinowicz, Max (November 22, 2017). "Liev Schreiber talks Jewish heritage at Federation CJA's closing event". Global News. Retrieved May 12, 2018. ^ "Liev Schreiber Talks Filmmaking at TAU". New York Jewish Life. February 6, 2018. Retrieved May 12, 2018. ^ Westbrook, Caroline (November 23, 2005). "Liev Schreiber". SomethingJewish.co.uk. Retrieved May 12, 2018. ^ Schleier, Curt (May 4, 2017). "How Liev Schreiber's Jewish grandpa inspired him". JTA - Jewish news. Retrieved May 12, 2018. ^ Round, Simon (January 8, 2009). "Interview: Liev Schreiber". The Jewish Chronicle. Retrieved May 12, 2018. ^ a b c d e f g h Lahr, chris (1999-12-13). "Fresh Prince: Why Liev Schreiber is Ready to Play Hamlet". The New Yorker. pp. 46–52. ^ Dougherty, Margot (January 2009). "Knotty Pinings". LA Magazine. Retrieved November 19, 2010. ^ Bednářová, Veronika (2004-07-07). "Mining Cultural Identity and a Writer's Motives" (PDF). Festival Daily. Archived from the original (PDF) on 2008-05-29. Retrieved 2008-05-19. ^ Leve, Ariel (June 29, 2016). "LIEV SCHREIBER IS LOOKING FOR CLARITY". Esquire. Retrieved May 12, 2018. ^ "Winlaw-raised actor appears on Jimmy Kimmel Live!". Nelson Star. Black Press. June 17, 2014. Retrieved June 25, 2014. ^ Topel, Fred (December 31, 2008). "Liev Schreiber on Defiance". CanMag. Retrieved May 12, 2018. ^ a b Hong, Catherine (October 2008). "Liev Schreiber profile". W. Archived from the original on 2011-04-25. Retrieved 2008-11-19. ^ Blair, Cynthia (2008). "1984: Liev Schreiber Enrolls at Friends Seminary in NYC". Newsday. Archived from the original on October 16, 2007. Retrieved 2008-05-21. ^ "Earle Gister, Yale Acting Master, Stages His Passion, The Seagull, in NYC". Playbill.com. May 24–29, 2004. Archived from the original on 2004-12-18. Retrieved August 22, 2018. ^ a b c Rice, Lynette (2007-01-26). "Liev Among the Dead". Entertainment Weekly. Retrieved 2007-01-29. ^ Marks, Peter (1998-08-17). "Theater Review: Fairy-Tale Plottings of a British Royal Family". The New York Times. Retrieved 2007-01-11. ^ Lahr, John (2003-07-28). "Time Trials". The New Yorker. pp. 88–91. Retrieved 2008-05-21. ^ "2018 Kia Stinger GT ǀ Twin Turbo V6 with RWD or AWD". YouTube. ^ Finn, Robin (2003-01-08). "A Role That's Hard to Shake Off: The 9/11 Antihero". The New York Times. Retrieved 2008-03-22. ^ "Everything is Illuminated". Rotten Tomatoes. Retrieved 2007-01-11. ^ "The Academy of Motion Picture Arts and Sciences" (Press release). Academy Invites 120 to Membership. July 5, 2006. Archived from the original on July 6, 2006. Retrieved 2008-05-21. ^ Graser, Marc; Siegel, Tatiana (2008-02-19). "Reynolds, will.i.am join 'Wolverine'". Variety. Retrieved 2008-12-15. ^ "Liev Schreiber on Scream 4; Is He In or Out?". DreadCentral. ^ "Who Won't Be Returning in 'Scream IV'? Cotton Weary". BloodyDisgusting. Retrieved March 10, 2018. ^ Logan, Michael (October 14, 2013). "The Comics' Real Heroes". TV Guide. pg. 27. ^ Jr, Mike Fleming (June 10, 2015). "Hockey Brawler Pic 'Goon' Sequel Has Wyatt Russell Squaring Off With Liev Schreiber, Seann William Scott". deadline.com. Retrieved March 10, 2018. ^ Cox, Gordon (18 April 2016). "Liev Schreiber Cast in Broadway's 'Les Liaisons Dangereuses'". ^ "What Logan was going to do with Sabretooth", CinemaBlend.com; accessed March 10, 2018. ^ "Naomi Watts Refuses To Rush Into Marriage With Liev Schreiber". Exposay.com. 2009-01-30. Archived from the original on 2009-02-01. Retrieved 2010-07-07. ^ "Naomi Watts & Liev Schreiber Have a Baby Boy". People. 2007-07-26. Retrieved 2008-05-21. ^ Lynn, Megan (2007-07-26). "At Last! Naomi Watts Gives Birth to Baby Boy". Us Weekly. Archived from the original on February 14, 2008. Retrieved 2008-12-15. ^ Hamm, Liza; McNeil, Liz (2008-12-14). "Naomi Watts & Liev Schreiber Have a Baby Boy". People. Retrieved 2008-12-15. ^ Hamm, Liza (2008-12-15). "Naomi Watts & Liev Schreiber Name Baby Samuel". People. Retrieved 2008-12-16. ^ "Naomi Watts' Wish? A Baby Girl Guarantee!". Celebritybabies.people.com. 2010-04-28. Retrieved 2010-07-07. ^ Nessif, Bruno (26 September 2016). "Liev Schreiber and Naomi Watts Split After 11 Years Together". E! News. United States: NBCUniversal. Retrieved 26 September 2016. ^ "#raydonovan #berniesanders #feelthebern". Instagram. March 31, 2016. Retrieved November 26, 2016. Wikimedia Commons has media related to Liev Schreiber.